You spent the summer months instilling the idea of “Safety First” in to your little one and making sure that they put their (properly fitting) bicycle helmet on every time they went for a spin. Knowing the importance of setting a good example you most likely wore your helmet too. The snow is now here (or on it’s way depending on where you live) and it’s time for winter sports. Time to put away that bicycle helmet and break out the seasonally and activity appropriate head gear. Not all helmets are created equally. They have different safety features depending on the type of sport or activity. 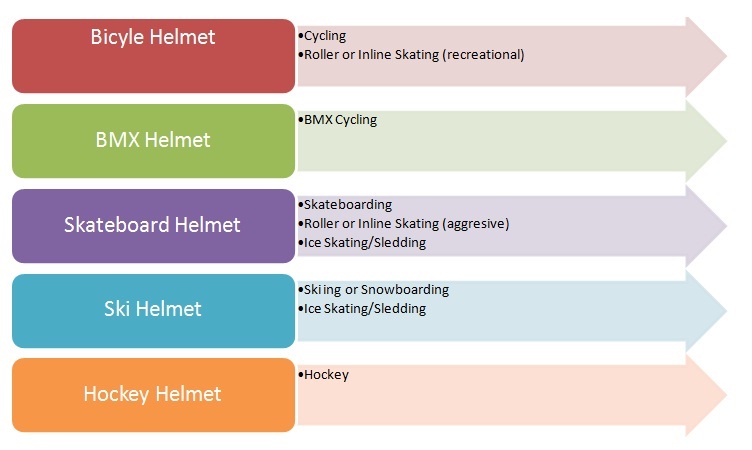 It’s important that you chose the right type of helmet for your child (and yourself) to help protect them from head injuries. This is just a guide for some of the more common activities your children may be involved in. Of course there are many more sports and activities that require specific helmets such as – football, equestrian, motorcross, baseball, etc. In addition to making sure your kids are wearing the right helmets, it is important to make sure they are in good condition. Always replace a helmet after a major impact, even if it looks ok. Hockey helmets can withstand multiple “normal” impacts (normal for the sport) but should be replaced after a “severe” impact. Replace helmets as your child outgrows them. Proper fit is essential! You can find a pretty good selection of helmets at your local Walmart or Canadian Tire but if you are having trouble finding the right helmet or the right size I highly recommend ordering from Safe Kids Canada. They have a great selection of helmets at really great prices. While you’re there you can find tons of other great information on helmet safety (or other kid related safety).